The Bohemian Leopold Anton Kozeluch (1747-1818) belongs to that throng of musicians that filled late 18th-Century Vienna, and which included Dittersdorf, Vanhal, Salieri, Clementi, Schenck, Hoffmeister, von Winter (based mainly in Münich but many operas performed in Vienna), Mozart, Krommer and the two Wranicky/Vranicky half-brothers Paul/Pavel and Anton/Antonin, to limit myself to those of roughly the same generation (all born between 1739 and 1761). 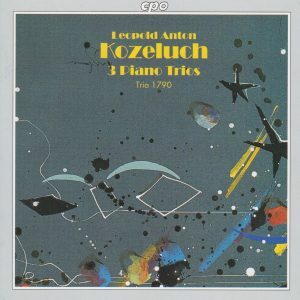 They may have been highly successful in those days (which was the case of Kozeluch, who was even offered by Archbishop Colloredo of Salzburg the post he had just kicked Mozart out of, and for a more-than-doubled stipend – and Kozeluch was highly regarded enough in Vienna that he was able to decline), but they were overshadowed in the eyes of posterity by the towering figures of Haydn, Mozart and Beethoven. From 1781 to 1810 Kozeluch published no less than 60 trios, so the three here (from 1788 for the G minor and A major, and 1789 for the E minor) barely skim the surface. That part of Kozeluch’s output must have met with great success, since they had publications in Paris and London soon after their Viennese appearance. On the face of it the trios, inscribed “sonatas for the Harpsichord or Piano Forte with accompaniment of Violin and Cello”, may appear rooted in the pre-classical models, but not so. While the cello assumes a rather subservient harmonic role reminiscent of the earlier basso continuo, the violin is an equal partner with the piano: these are real, classical trios. But it’s not just a question of form and instrumental roles. In the range of emotions they convey, these are great works, with a perfect mixture of charm, songfulness and drama. The playful and galant charm is located mainly in the slow movements, which makes them more Mozartean or Haydnesque than Beethovenian, but there’s plenty of Beethovenian enthusiasm and drama in the outer movements, mixed with the outbursts of charm that at times anticipate the Schubert of the Trout Quintet (the Finale of the E minor is more along the lines of full charm with very few outbursts of drama). The liner notes insist on the 4-measure-long theme somewhere in the first movement of the A major (track 4) that Beethoven will echo in the Waldstein; I haven’t been able to locate it, although there are many harmonic progressions that sound very Beethovenian indeed. But the beginning of the Finale of the G minor (track 3) sounds strikingly like Beethoven’s Farewell Sonata. When I hear this, sure, if I concentrate, I can probably tell why Beethoven’s trios are superior. But those of Mozart and Haydn? No, I can’t really – maybe because I’m not so familiar with that specific aspect of both composers’ output. And even Beethoven: when I hear this, in fact, I don’t try and compare with those of Beethoven: I just enjoy. Trio 1790 plays on period-instruments – the difference will be heard mainly with the fortepiano. It sounds fine, not too “toy-piano-ish” as some of these instruments sometimes do. TT 63. 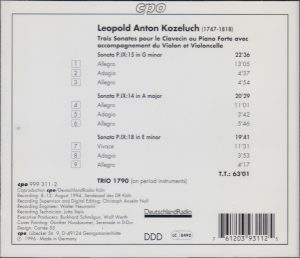 The four symphonies of Kozeluch recorded by Concerto Köln for Teldec are also superb.